Sleep apnea is a disorder with pauses in breathing while you are asleep. These pauses can last for 10-30 seconds at a time. During one night, breathing may stop up to 400 times. With any of sleep apnea, the brain will sense the pause in breathing and wake you up. You may not be fully awake and often do not remember in the morning. However, waking breaks the sleep cycle. Poor sleep can make you tired during the day. Over time this will also lead to other serious medical conditions like high blood pressure or depression. Obstructive—Muscles in the body to relax during sleep. This can let soft tissue in the back of the throat and mouth to sink toward the throat. 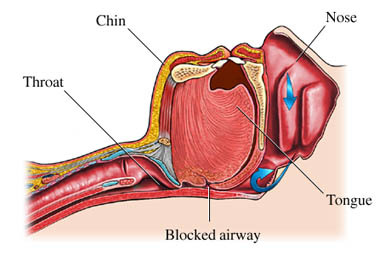 If the tissue blocks the airway it will stop normal breathing until it was cleared. Central—Breathing is controlled by signals from the brain. If the signals are not working properly, breathing can be slowed or paused. Mixed—Both soft tissue and nerve signals are causing problems. Your partner may notice loud snoring or that you stop breathing at night. You may notice that you wake often during the night. Sleep apnea also increases the risk of car accidents. It is most likely due to lack of sleep. If you are sleepy during the day avoid driving or using hazardous equipment. The doctor will ask about your symptoms and health history. If the doctor thinks it may be sleep apnea you will be sent for an overnight sleep study. Most will take place in a clinic but some may be done at home. These details will help your doctor see how severe the sleep apnea is. Treatment will decrease symptoms so that you can sleep better. This will also reduce risk factors for other health conditions. The exact treatment will depend on the type of sleep apnea and how severe it is. If you are overweight, lose excess weight. Work with your doctor or a registered dietitian to help create a plan. Avoid sedatives, opioids, sleeping pills, alcohol, and tobacco. They will make your tissue relax and make apnea worse. Try sleeping on your side instead of on your back. Soft tissue will fall directly into your airway if you are on your back. Use pillows to help you prop yourself into a better position when sleeping. Oral appliances are small devices you put in your mouth. They will keep the lower jaw in a forward position. This position pulls the tongue away from the airway. It may be helpful for those with mild sleep apnea. The devices may also be used for those with moderate obstructive sleep apnea who cannot use CPAP therapy. Continuous positive airway pressure (CPAP) is a machine that gently blows air into your airway to help keep it open. The air is delivered through a mask that you wear while sleeping. CPAP will help you manage sleep apnea but it does not cure it. If you stop using CPAP, the sleep apnea will return immediately. Oxygen may also be added at night with CPAP. It may be needed if the level of oxygen in the blood falls too low during sleep. Surgery may be helpful for some with obstructive sleep apnea. It can be used to shrink or remove extra tissue. A less available option is called phrenic nerve stimulation. A device is implanted under the skin and sends signals to the phrenic nerve. This nerve controls a large muscle that helps draw air into the lungs. This options is still being assessed. Certain medicine may be used to reduce daytime symptoms. Other medicine may need to be changed or stopped if they are making sleep apnea worse. You may be able to prevent sleep apnea by maintaining a healthy weight. Central sleep apnea. EBSCO DynaMed Plus website. Available at: http://www.dynamed.com/topics/dmp~AN~T115123/Central-sleep-apnea. Updated November 21, 2017. Accessed March 23, 2018. Kushida CA, Littner MR, Hirshkowitz M, et al. Practice parameters for the use of continuous and bilevel positive airway pressure devices to treat adults with sleep-related breathing disorders. Sleep. 2006;29(3):375-380. Littner MR, Kushida C, Wise M, et al. Practice parameters for clinical use of the multiple sleep latency test and the maintenance of wakefulness test. Sleep. 2005;28(1):113-121. Mason M, Welsh EJ, Smith I. Drug therapy for obstructive sleep apnea. Cochrane Database Syst Rev. 2013;(5):CD003002. Morgenthaler TI, Kapen S, Lee-Chiong T, et al. Practice parameters for the medical therapy of obstructive sleep apnea. Sleep. 2006;29(8):1031-1035. Obstructive sleep apnea (OSA) in adults. EBSCO DynaMed Plus website. Available at: http://www.dynamed.com/topics/dmp~AN~T115600/Obstructive-sleep-apnea-OSA-in-adults. Updated November 21, 2017. Accessed March 23, 2018. Pack AI, Maislin G. Who should get treated for sleep apnea? Ann Intern Med. 2001;134(11):1065-1067. Sleep apnea information for individuals. American Sleep Apnea Association website. Available at: https://www.sleepapnea.org/learn/sleep-apnea. Accessed March 23, 2018. 1/28/2015 DynaMed Plus Systematic Literature Surveillance http://www.dynamed.com/topics/dmp~AN~T115600/Obstructive-sleep-apnea-OSA-in-adults: Teodorescu M, Barnet JH, Hagen EW, et al. Association between asthma and risk of developing obstructive sleep apnea. JAMA. 2015;313(2):156-164. 8/11/2015 DynaMed Plus Systematic Literature Surveillance http://www.dynamed.com/topics/dmp~AN~T115600/Obstructive-sleep-apnea-OSA-in-adults: Molnar MZ, Mucsi I, Novak M, et al. Association of incident obstructive sleep apnoea with outcomes in a large cohort of US veterans. Thorax. 2015;70(9):888-895. 12/20/2016 DynaMed Plus Systematic Literature Surveillance http://www.dynamed.com/topics/dmp~AN~T115123/Central-sleep-apnea: Costanzo MR, Ponikowski P, Javaheri S. Transvenous neurostimulation for central sleep apnoea: a randomised controlled trial. Lancet. 2016;388(10048):974-982.